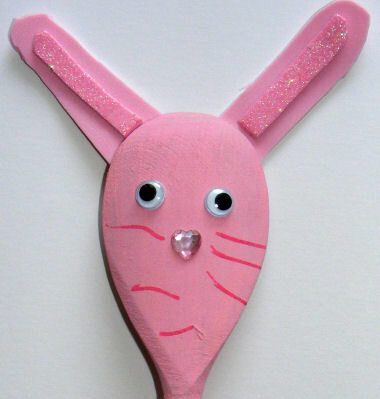 Kids can have fun making this Bunny Wooden Spoon Puppet - perfect for Easter, a farm theme, or any time puppets are required! 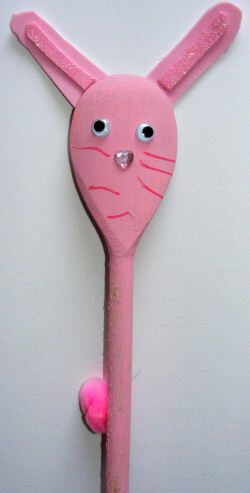 They might like to make our Wooden Spoon Puppet Chick too. Cut two ears from craft foam. Cut two inner ears from a contrasting shade of pink foam and glue these to the centre of the ears. Glue the ears to the top of the spoon. Glue a pink pompom to the handle for his tail. Stick the pink sticker on to the back of the spoon for a nose and stick on the two wiggle eyes.